to really live: Why think so much? Because it shapes you up. Why think so much? Because it shapes you up. Why ask so many questions? 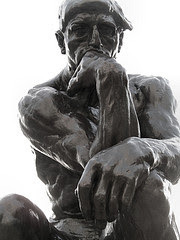 What's the use of thinking so much? Not everyone loves mental calisthenics. Most of us are happy to be done with school. Mental (metal as in the music is the same for me) anguish where we feel lost and cannot quite figure out an answer is tormenting. Philosophical questions of 'why', 'what', 'therefore' is daunting for most of us. So we should avoid it. Don't worry, be happy. What's done is done. No point crying over spilled milk. Firstly, we all worry as surely as we all want to be endlessly happy. (and if we were, would we still be happy?) Worry seems to come with the territory. Worry happens because we want certain outcomes but we cannot ensure it occurs. We worry if the boss will like the presentation. We worry if eating that weird piece of meat coz all our friends were digging in would make us sick. We worry if we can retire. We worry about the kids (big worry today!). We worry about sagging skin, thinning air, thickening waistlines and blocked arteries. Someone wisely said, "worrying is like a rocking chair, it keeps you moving, but gets you nowhere!". So between our tendency to worry and the pointlessness of it - is the necessary work of reflecting on what it is we are worrying about and how much worry-power we want to give it. A little sitting in the rocking chair can be quite useful to help us figure out what is important to us and whether we are being sensible about what we are doing about it. I worry quite often over my children; but I pause to talk to my worries and find out what they mean. Maybe my expectations are way off the chart. Maybe I am expecting too much of myself. Maybe I slipped and should be doing something. What's done is done -- unless it can be undone. There is an old idea called Restitution. This is where we set right what we did wrong. I fear we have forgotten those days. It appears we are in such a haste that people move on and carry much baggage of unresolved conflicts within their bosoms often. are the outcomes of accumulated soul barang-barang*. Disappointment with self and others, being unfairly treated, being put down, feeling neglected; suffering from another's anger, very high expectations; failures and setbacks -- all of these are wounds that need time to heal. 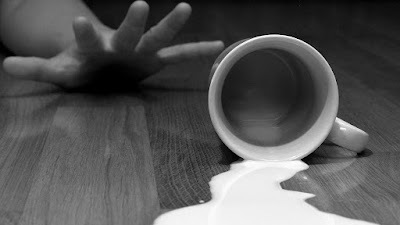 Each wound is unique and require some special care and the appropriate salve.... often involving crying over spilled milk. The milk mattered! It costs. So it's totally okay to cry for a bit. Through those teary eyes, consider why this mattered so much, why it hurts they way it does. Our gains may be useful indicators of our life's potential. Our pains are no less useful. In fact, they may tell us more. Humans are pack creatures in a way, so we all go after the same rewards very often. But our pains tend to be unique to each of us. Why does someone hurt over an insensitive remark while another find it fairly easy to shrug off (assuming this person is not pretending}. Why does the death of a loved on impact one family member differently from another? Why does a change in plan upset one much more than another? Our pains are wonderful indicators for who we are, what we cherish, and what we find security in. 2. you are shielded from the deception of the enemy who loves to disguise as an angel of light (the easy way out, the get-over-with-this). A solution at hand is not the same as a resolution that leads to peace and a deeper, richer life.